The exhibition is a programme under "Inisiatif NEGARAKU" in conjunction with the 60th year anniversary celebration of Malaysia independence. The exhibition aim is to awake the importance of visual art treasure of the country. It also give a chance to Malaysian to appreciate the great art pieces that hardly seen on usual days. The 88 artworks exhibited are selected from 72 artists, those are the important pieces in Malaysian history of modern art. According to the exhibition catalogue, they selected artworks and arranged them considering genre, movement, influence and artists' rationale. The age of artists also noted beside the art pieces for audiences to imagine the process of art creation. I visited to the exhibition twice, the first time was with TOA field trip, and it is important because it gave the first impression to me who don't know any background of it. Spatial, historical and humanities were the keywords that came into my mind. I keep going back to the sculpture Bujang Berani (1991) by Bayu Utomo Radjikin, it was the suffering expression that pulled me into it. 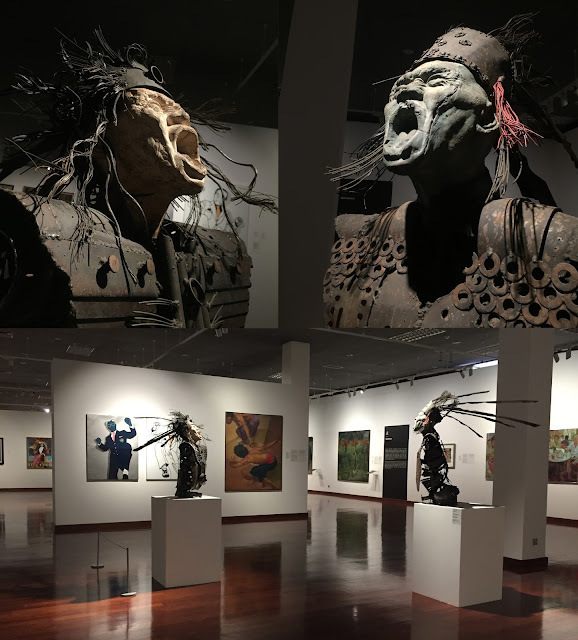 They were just standing there with perhaps the strongest expression in someone's life, screaming quietly to the quiet and cold gallery, and their suffer is eternal as they were captured in a still sculpture. It was my favourite piece since I saw its image on secondary school Seni subject textbook, this is the first time I stand in font of the real sculpture. It was also the first time I knew Radjikin produced a second piece entitled "Lang Ngindang" on the second year. It amazed me that the artist was just aged 22 when he created Bujang Berani after reading caption beside it. Diagram 1: The sculptures were placed face to face, seems screaming at each other. Somehow it look complete when they are placed together. It was my experience on space arrangement on the first visit, on second time I went there with a target to study the the exhibition design. When I walked in to the exhibition space, I tried to figured out which direction to start walking from "Landscape" category, soon I realised the exhibition is not arranged according the timeline but theme. It has five themes: Landscape, Social Interaction, Beliefs, Abstract and Inheritance/Independence. 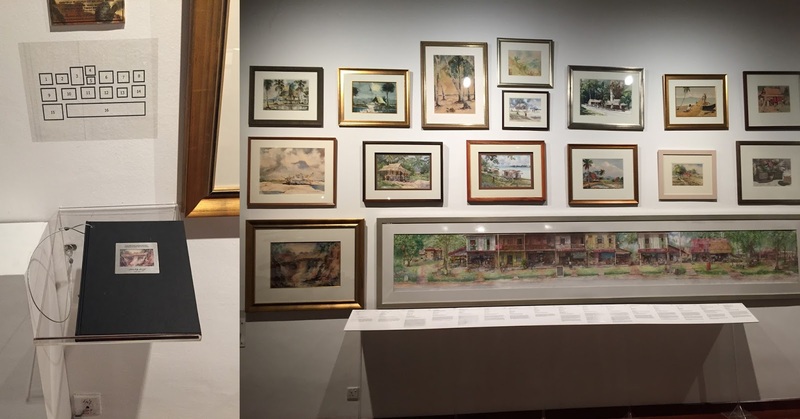 Landscape category has the earliest painting among all the exhibited art works, it includes work from 1940's, featuring Abdullah Ariff who is known as father of Malaysia modern art. The most famous painting of him "Lukisan Bumi yang Bahagia - Lombong Biji Timah Malaya" (1950) was the spotlight in the category. Even though it is hanged together with other batch of art works, its position still the most obvious to be seen, despite Ariff's portfolio book and bronze plate of National Heritage certification placed at the side of art works. it is at eye level and there is a book just beside it, attracting people to approach the painting. The curators also put art works that has similar content together for audience to compare them. In Social Interaction category, a half-closed area is built using walls, and portrait paintings are hung in the area. When people stepped into it, they feel surrounded by the portraits/faces. The exhibition uses this method to create many sections with different emotion. Diagram 3: Top view plan to explain the section mentioned above. See Part 2 on next post.